Mentioned in the parish baptism and marriage records but locations unknown. Places mentioned in The Survey and Distribution book and Petty’s Atlas(1641..1703). Places mentioned in The Tithe Applotment book (1825-35). Miscellanious Notes . . . .
Archealogical places of interest in this parish. Islands associated with this parish. Geographical features named in this parish. as applotted under the tithe act. Riverview, of M: J. Hunt, Esq. Houndswood, of M. D’Arcy, Esq. to the Warden of Galway, and the remainder to. the vicar. gave the ground. : it has a handsome marble altar-piece, presented by T.
by the Lynch family with 30 acres of land, to which is attached a chapel. Corrib, Connemara, and the surrounding country. Sruthair, a stream. — Four Masters. in the case of Irish place names. 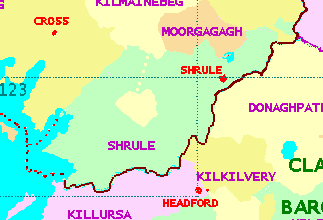 This parish occupies most of the southern portion of the barony of Kilmaine. through Cross to Headford passes across this parish from W. to S.E. of this parish, and comprises the townlands of Ballisnahyny East and Carrowoughteragh. and separates the counties of Galway and Mayo there. of the Burkes of Mayo – Downey. by the castle walls from the numbers slain in the engagement. are attributed to the Burkes. Situated in the south side of Ballycurrin td. The seat of Captain Lynch. In the east side of Dalgan Demesne. The residence of Patrick Kirwan, Esq. This is a large mansion of hewn limestone. Its principal feature is its spacious pillared hall surmounted by a dome. Attached to the residence is a large, well-timbered demesne. In the west side of Bunnafollistran td. The seat of Arthur Browne, Esq. In the N.E. side of Ramolin td. The residence of Mr.. Foy. Situated in the east side of Moyne td. The seat of Mr. John Golding. In Lough Corrib. Contains 0a. 1r. 26p. These are 3 islands in Lough Corrib. The largest island contains 2a. 2r. 3p. The smallest contains Oa. Or. 39p. The medium-sized island contains Oa. 1r. 16p. Inse Ui Chuinn , 0’Quin’s island. An island in Lough Corrib. Inis Caorach, island of the sheep. In Lough Corrib. Contains Oa. 1r. 13p. A large island in Lough Corrib. Contains 6a. 2.r. 39p. In Lough Corrib small island containing Oa. Or. 35p. Local 40 : Abhainn Dubh, black river. This river runs by the east and south sides of the parish, forming the County, Barony, Parish and Townland boundaries. It falls into Lough Corrib. Loch Laoigh, the lake of the calf. Loughanlee : Inq. temp. Jac. The lake is situated on the north boundary of the parish, and is common to the townlands of Ramolin and. Dalgan. Loch na Cille the lake of the church. Situated on the north boundary, partly in this parish and partly in Moorgagagh parish. Local 43 : There is a Pollach Riabhach also. Pollach Ciarain , St. Kieran’s hole. In the east side of the td. of Mocorha. spring well. Tobar Searbh , bitter well. In the north side of the td., and adjacent to the parish boundary. spring well in Shrule td. Tobar Locha Laoigh , well of the calf’s lake. In the N.W. side of the townland. of Dalgan Demesne, and adjacent to Lough Lee. This is a spring well, considered sacred. See Section 27 and the remarks therein. In the south side of Shrule td. Gort a’ Liagáin ,field of the standing-stone. 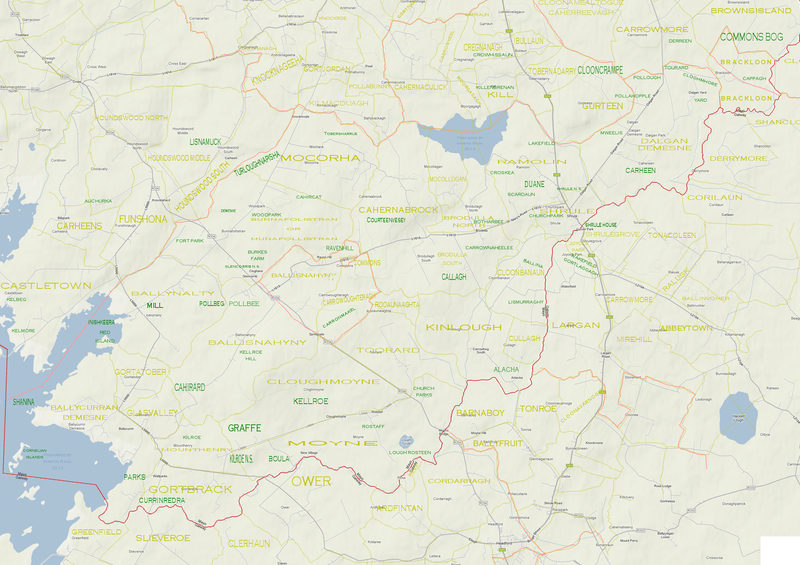 See townland name Section 20 : On the boundary common to the townlands of Kinlough and Brodullagh South. In the east centre of the td. of Ballisnahyny East, on the north end of the site of a fort by the side of a lane. A massive tower, 32 feet by 42 feet at the base of the batter. The walls are still over 40 feet high. See Section 2. Situated in the south side of Ballycurrin td. In the central part of R Mocorha td. In ruins. Situated in the east side of the townland of Moyne, near, the parish mearing. The ruins of what was once a very formidable stronghold. It consists of. a massive tower, some 50 feet high. Situated in the N.W. side of the townland of Moyne.